Product owners are at the center of every development cycle. But what do they actually do? 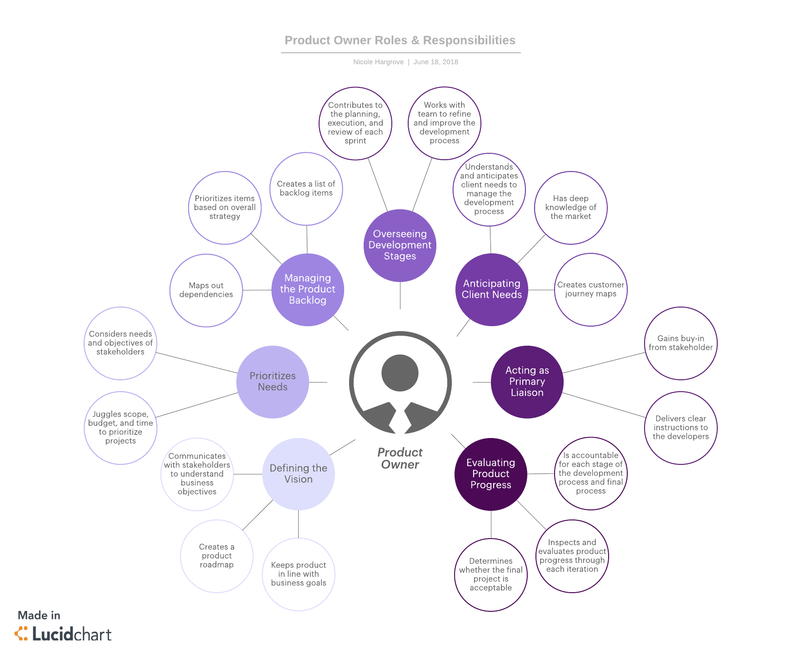 Though a product owner’s role can vary depending on the environment, they typically have several key roles and responsibilities covering everything from business strategy to product design. At the most basic level, a product owner is the leader responsible for maximizing the value of the products created by a scrum development team. But to do this, an agile product owner takes on several roles, including business strategist, product designer, market analyst, customer liaison, and project manager. The product owner takes the lead in many areas of product development. One day they will need to access their deep well of market knowledge to strategize and present their vision to stakeholders. Another day they will need to roll up their developer sleeves to help the team meet their goals during a sprint. Here are just a few of a product owner’s responsibilities. The agile product owner is the point person on the product development team, using their high-level perspective to define goals and create a vision for development projects. Product owners are responsible for communicating with stakeholders across the board, including customers, business managers, and the development team to make sure the goals are clear and the vision is aligned with business objectives. Having a product owner with a higher perspective ensures that the team maintains a cohesive vision despite the flexible and often fast-paced nature of agile product development. Everyone needs to be on the same page in order for a project to work effectively. A product owner can help the team maintain that vision is by creating a product roadmap. The product roadmap is a high-level, strategic visual summary that outlines the vision and direction for the product offering over time. It is both a strategic guide for stakeholders to reference as well as a plan for execution. 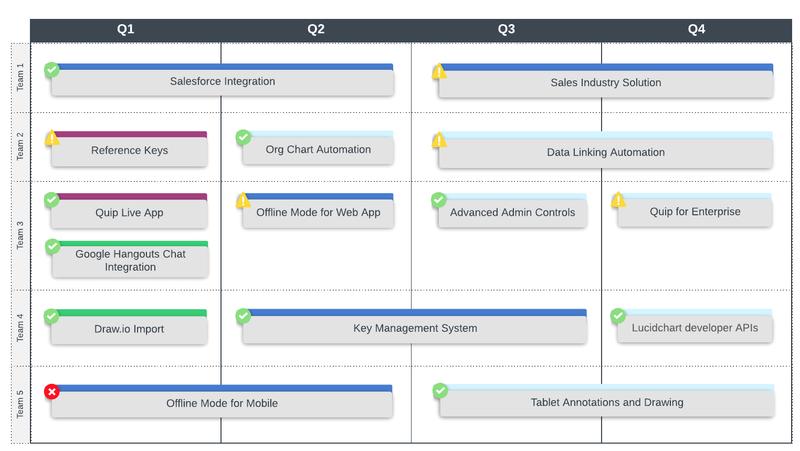 Lucidchart has the functionality you need to create a clear and thorough product roadmap, combined with collaborative features that make it easy to share your vision across the organization. You can even link data to your document and use conditional formatting to view the status of each milestone at a glance. Ready to communicate with team members and update stakeholders instantly? Get started with the project roadmap template below. One of the most important responsibilities for a product owner is managing the product backlog. This is the development team’s project to-do list. The product owner’s responsibility is to create the list of backlog items and prioritize them based on the overall strategy and business objectives. Additionally, the product owner will need to map out project dependencies to inform the necessary sequence of development. The product backlog isn’t a static to-do list though. It is a live document that should be continually updated based on evolving project needs throughout development. Because the product backlog will change frequently, the product owner must make the list accessible and available to all stakeholders (particularly developers) to ensure optimized performance and project outcomes. Another key role of the product owner is to prioritize needs. In other words, they must juggle the triangle of scope, budget, and time, weighing priorities according to the needs and objectives of stakeholders. For example, if the product under development needs to launch within six months, that constrains the scope of the project. As the project evolves, the product owner will have to gauge which areas have flexibility and which don’t to determine how and when each iteration and product element will be developed. With the vision, strategy, and product priorities set, the product owner should spend a significant amount of time overseeing the actual development of the product. They are a key player throughout each event, including planning, refinement, review, and sprint. During the planning stages, the agile product owner works with stakeholders to identify and organize the steps required for the next iteration. They will then meet with their team to refine the process, identify areas for improvement, and support the sprint. The successful product owner will be an expert at understanding and anticipating the client’s needs to more effectively manage the development process. Their deep market knowledge and communication skills allow them to anticipate problems or needs and address them. 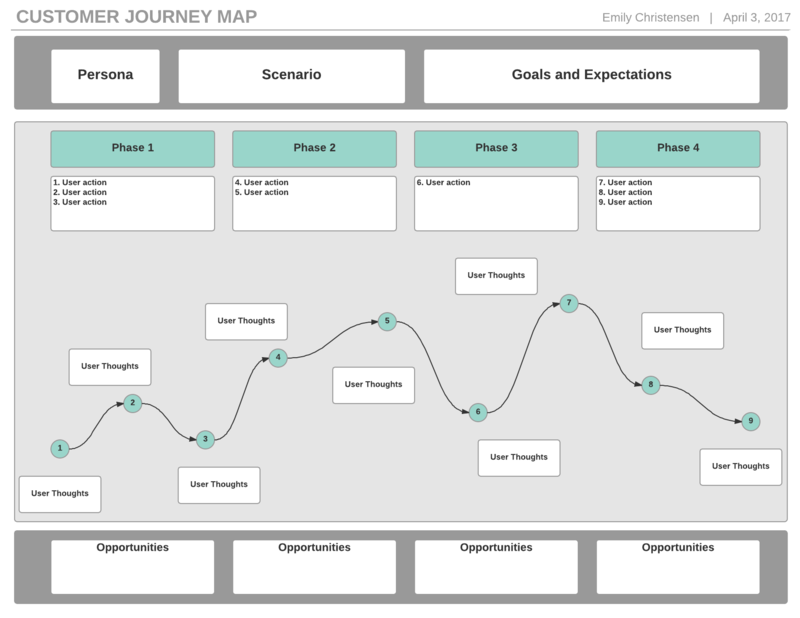 Lucidchart can help you think one step ahead of your clients with customer journey mapping. These visuals create a shared vision for the customer experience. Try out this customizable template—it will save you time and effort so you can put all your energy into reading your customers’ minds and wowing your clients. The product owner is also the primary communicator and link between stakeholders and teams. As such, they have to be expert communicators, making sure there’s buy-in from stakeholders on all major decisions and strategy and clear instructions and deliverables for the developers. The product owner is accountable for each stage of the development process and the final product. They take a primary role in inspecting and evaluating product progress through each iteration. The product owner makes the judgment call on the performance, deciding if the team needs to go back to the drawing board or if they can move on to the next steps. Agile product owners wear many hats. So they need software solutions that can adapt to their changing roles as quickly as they do. Lucidchart stays with you at every step of the development process, making it easy to transition from outlining the customer journey and mocking up product designs to mapping product dependencies and sharing your work with stakeholders. No matter what stage of the development process you’re at, Lucidchart can help. Sign up today to try Lucidchart for free and own your products proudly.